The day before I left for vacation last month, I received an email inviting me to participate in a worthwhile cause. As excited as I was about lending a hand, even in a small way, my hands were tied until my return a few weeks later but now I’m very happy to be sharing this with you. I was invited to participate in Macaroni Grill’s effort to rally the nation in ending childhood hunger in America. Fact: 1 out of 5 children, 16 million, struggle with hunger each day. Fact: 62% of America’s teachers regularly see children who come to school hungry because they aren’t getting enough to eat. Truth be told, I’ve read these statistics before but the words never sank in like they should. Sometimes I find myself in a bubble–sheltered from ugly truths like this one until a pinprick pops me back into reality–so I was very happy to receive the invitation. Give: For the month of September, donate $2 to any Macaroni Grill location and you will receive $5 off your next visit. Each donation can help connect a child in need up to 20 meals. Find a location here. Share: Share a photo from the Mac Grill Give Facebook Gallery and Macaroni Grill will help a child connect with a meal. Tag: Tag an Instagram photo or tweet of your Mac Grill experience with #macgrillgive. For each tag Macaroni Grill will connect a child with a meal. I was asked to deliver this message by sharing a favorite Italian dish/meal which could help to connect a child to up to 500 meals. I’ve shared many of my favorite pasta dishes on this blog so I came up with a new one that would appeal to adults and kids alike. It’s a simple, satisfying dish that can be easily thrown together on a busy weeknight. I dressed up a basic pomodoro sauce with vermouth (you can use wine or chicken stock instead) and added a bit of cream for richness and chicken to make it a more complete meal. I didn’t do it here but you can also add spinach to up the nutrition factor. Make it your own by changing things up according to your family’s favorite ingredients. 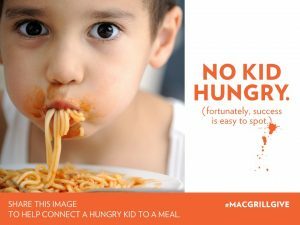 If you would like to assist in Macaroni Grill’s efforts and Share Our Strength’s No Kid Hungry campaign please click on the links below. Prepare the pasta according to package directions while you cook the sauce. Drain and set aside. Heat olive oil over medium heat in a large pan then add the garlic and chicken. Cook for 3 - 4 minutes making sure the garlic doesn't burn. Salt lightly. Add the vermouth, allow to cook down for 2 - 3 minutes before adding the diced tomatoes. Cook for another 4-5 minutes then add the half-and-half or cream. Cook for another 2 - 3 minutes then season with salt and pepper, to taste. Arrange pasta on plates and ladle sauce over. Garnish with Parmesan cheese and chopped parsley. 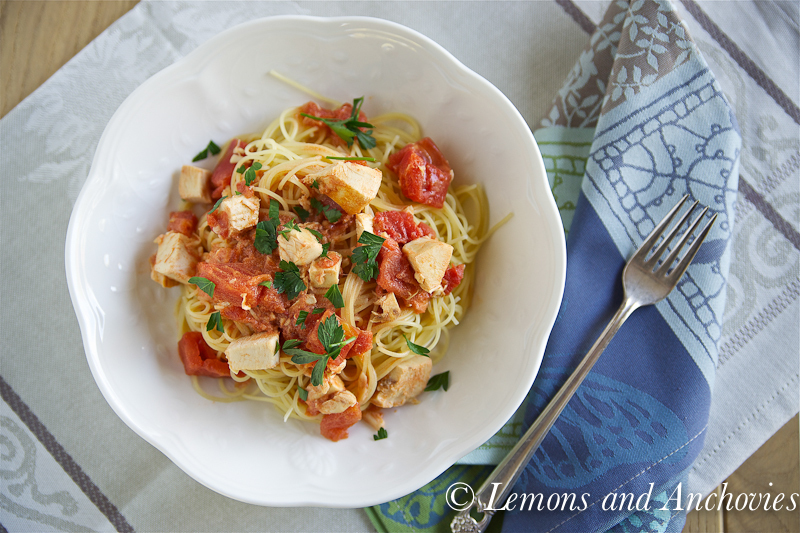 This is a perfect pasta dish for a wonderful cause! It reminds me of one I used to order at a favorite Italian restaurant but haven’t enjoyed in ages – must try! This is like one of my kids’ favorite pasta variations at home. 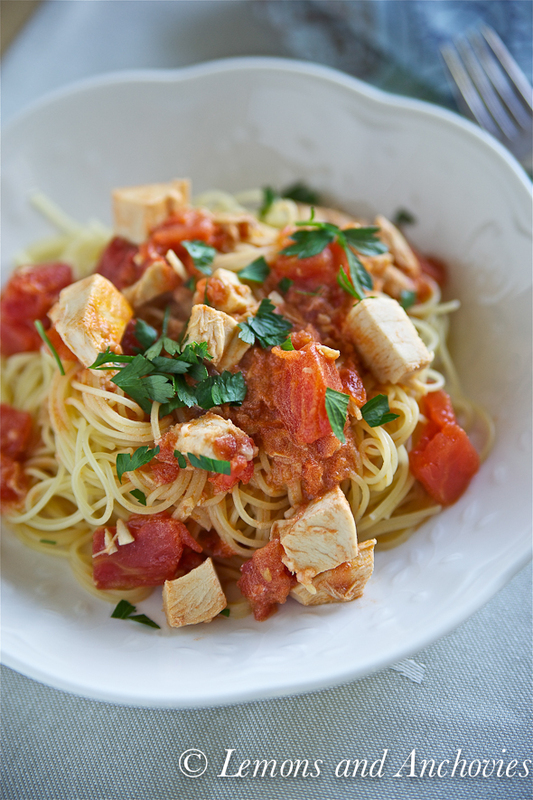 Chicken and tomato sauce is a sure hit with kids and adults alike. I like your vermouth addition. I will give it a try next time! A wonderful cause Jean and a delicious pasta dish. We are big time pasta fans and new ideas are always welcome. The photos are so appealing, wish I could reach a fork in and have a bite! It’s great that you’re participating in the effort. We are all very lucky to eat well, so it is our duty to provide that opportunity to others if we can. Such a beatiful dish and an amazing cause to support. Thank you so much for helping to raise awareness about something so important! A wonderful cause and lovely dish! 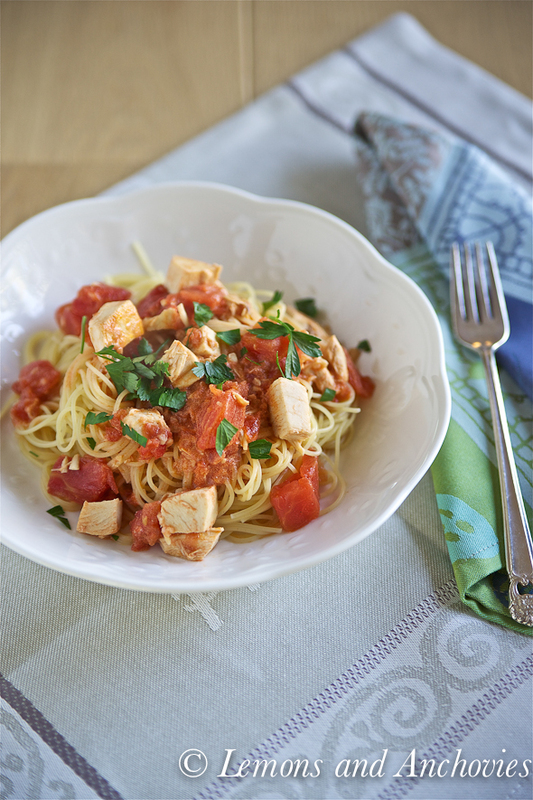 You did such a good thing for a good cause…wonderful looking pasta! For sure it’s must try! Loving your pics as always! This looks like heaven on a plate!! This pasta dish is beautiful! Light and hearty and not an overload of carbs. It’s so amazing with what you’re doing here for the campaign! And this pasta – YUM! Love the creaminess and easiness of this dish! Wow… I didn’t know that statistics either. So many hungry children. 🙁 You did a wonderful cause Jean and I admire of your effort to spread the words. I love this pasta! Sounds like my children would enjoy with lots of tomatoes and chicken! I love this plate/bowl – hard to know which one but it’s perfect for pasta/noodles where the plate is a little bend for scooping last piece… haha.